Economists often compare Australia to Argentina when analysing development. Both countries were colonised by European nations and subsequently received waves upon waves of migrants. Both countries also had natural resources that could be exploited and both were largely disconnected from the developed world. At the beginning of the 20th century, Australia and Argentina had industries based on primary production with roughly similar levels of per capita output. Today, Australia is firmly entrenched as a first world nation with a service based economy. Meanwhile, Argentina is clearly second world. Humans are believed to have arrived in Argentina around 10,000 years ago. Nomadic communities developed into farming communities. These farming communities in turn gave rise to the Inca empire that conquered north west Argentina. Nomadic societies prevailed in the south. In the 16th century, Spain established a permanent colony on the site of Buenos Aires. The Inca civilization was pillaged and then crushed in the quest for silver and gold.When conquesting the America’s, the Spaniards heroically told stories of fighting on their own. In truth, they enlisted many of the locals to fight for them, but then took the glory. At the start of the 20th century, Argentina had grown into one of the world’s ten richest nations and a massive migration program increased the population seven fold. Internal social conflict then caused Argentina’s prosperity to unravel. For 70 years, Argentina fluctuated between left-wing civilian control and right-wing military control. An increase in left-wing political activity culminated in a military junta taking control in 1976. In the following seven years, up to 30,000 people were disappeared and the British Falkland Islands were attacked. Australia's history was very different to Argentina's. Unlike Argentina, nomadic people in Australia never evolved into farming communities capable of building large cities or social groups powerful enough to crush and assimilate rivals. This was probably because the Australian environment was not conducive to high density farming communities. Australian urban society commenced with the forced transportation of British and Irish criminals in 1788. Like the hunter gatherers, the Europeans likewise found farming to be problematic and it was only the continued supply of food from England that allowed the colony to survive. With time, some productive farming regions were discovered, but not a sufficient number to attract large numbers of Europeans to migrate to Australia. Although Australia had some social turmoil between different sections of Australian society, it never experienced the kind of conflict seen in Argentina. Furthermore, it never battled for independence from its colonial master and never had military conflict between different regions of the continent. The tango is one of Argentina's most famous cultural exports. It is quite a unique dance because it is one of the few that is designed for the man to be the focus of audience eyes. The characteristics of tango are a reflection of its origins in the brothels of Argentina. Bandits would come out of the mountains for female company and find it with ladies of the night. 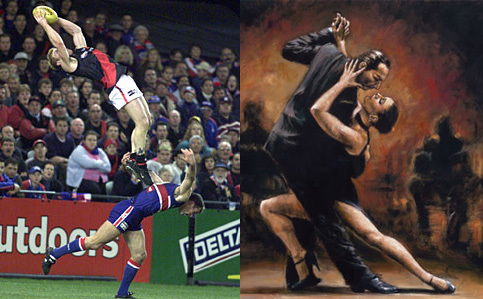 Unlike men from Argentina, men from Australia are not noted for their dancing prowess. Their lack of rhythm and stiff knees has many of them resembling a chicken or jack in the box bouncing from side to side. Other men just watch over the dance floor, beer in hand, as they perhaps beat their chin to the music. Despite the lack of rhythm, Australia has created a unique dance genre known as new vogue. The dances are based on ballroom and latin dances, but they have a sequence of steps that are continually repeated throughout the dance. Each routine lasts for either 16 or 32 bars of music, and is then repeated. This prescription of sequences makes new vogue dances quite easy to learn. In a very short period of time, new dancers can feel confident with new vogue dance and are able to change partners very easily. On the other hand, the latin dances have an assortment of steps that the man needs to spontaneously choreograph into a sequence as the dance goes on. Even though new vogue dances prescribe sequences, dancers can still be expressive through the shape and styling. In competition, dancers are required to have more refined beauty and feeling in their arm and torso movements. Consequently, the focus is less on the sequence of steps, and more on the overall expression of feeling and beauty. As the dances have open positions, they have ample opportunities to show these beauty and feeling, which can make them very attractive to watch. New vogue dances originated in the 1930s and 40s. One argument about their development proposes that Australian dancers rebelled against the dreary foot work of the old time English dances and started to choreograph their own sequences. The old time English dances used turned out foot positions, which limited the amount of movement that a good dancer could get. Another possibility is that is that Australian dance teachers wanted a range of dances that would be easier to teach, and less intimidating for men accustomed to dancing like a jack in the box. Both Australia and Argentina have invented horse games similar to polo. Argentina invented pato, which was like polo except a duck was used as a ball and thrown into a net. In the 1930s, new rules were drafted along the lines of polo and a real ball replaced the duck. In 1953, it was declared Argentina's national sport. Despite being Argentina's national sport, it is rarely played. Polocrosse is Australia's contribution to the world of horse sports. As the name implies, it is a combination of the English sport of polo and the American sport of lacrosse. Like polo, it's played outdoors on horses, but it uses a stick with a loose thread net. Goals are scored by throwing a sponge rubber between goal posts. Polocrosse was invented just prior to World War II by a Sydney couple. It subsequently spread across Australia, then to South Africa, England, France, Indonesia, the US and Uruguay. Argentina is one of the few South American countries to play rugby union and play it well. This would suggest that Argentine men are quite masculine. Argentina is also one of the few successful rugby playing nations to oppose professionalism. This would suggest Argentine men could be resistant to change. Even though rugby union is not very popular, Australia has produced successful national teams because it has been very open to professionalism. It partnership with New Zealand, it was Australian rugby that forced the International Rugby Board to accept professionalism in 1995. Soccer is very popular in Argentina and is almost seen as a religion. Like it is in most countries around the world, Argentina suffers problems with soccer hooliganism. From 1992 to 2002, 40 people were murdered at Argentine soccer games. In 2006, Gimnasia y Esgrima de La Plata fans allegedly burst into the dressing room with guns and threatened to shoot their own players. Allegedly, soccer fans have also been used as hired muscle by political parties. Soccer in Australia resides behind Australian football, cricket and rugby league in terms of popularity and suffers a persecution complex. Like most English speaking countries, Australians never really embraced it. Furthermore, like every English speaking country except England, soccer was referred to as soccer, not the generic title of football. After World War 2, soccer was revived by non-English speaking migrants from Europe yet still found it hard to make headway in a sporting culture dominated by Australian football in the south and rugby league in the north. Although soccer in Australia hasn't suffered as extreme hooliganism as in South America, fans have developed a victim culture that is unique amongst Australian football codes. A good example of the victim culture is in the title of Johnny Warren's (Australia's most celebrated soccer player) biography. Warren titled his book Sheilas, Wogs and Poofters, The Incomplete Biography of Johnny Warren & Soccer In Australia. Sheila’s is an Australian slang term for women. Wogs is an Australian slang term for southern Europeans. Poofters is a slang term for homosexuals. It is true that soccer is the victim of discrimination in Australia; however, soccer is not alone in that regard. For example, in the northern states, Australian football is seen as a nancy boy game played by Mexicans (people south of the border) yet it would be impossible to imagine an Australian football player titling a biography 'Nancy Boys and Mexicans'. Likewise, rugby league is seen as a meathead and bogan game in the southern states, yet it would be impossible to imagine a rugby league player titling a biography 'Meatheads and Bogans'. Finally, rugby union is ridiculed as a private school boy game administered by people wearing leather elbow patches yet it would be impossible to imagine a rugby union player titling a biography 'Private Schools and Leather Elbow Patches'. All the other codes deal with the discrimination and move on. Both Australia and Argentina have different groups of people arguing over interpretations of history as well as the justice that needs to be dealt on the basis of those interpretations. In Argentina, the debate centres around what happened between 1976 to 1983 when the country was ruled by a military junta. Some human rights groups have estimated that 30,000 people were killed and 500,000 people went into exile before democracy was restored. Those who say they were victims of the junta believe that their stories have been ignored and the culpable have not been punished. In Australia, the history wars have been fought between white people in regards to alleged genocide of Aborigines. The genocide was alleged to have commenced in the colonial era when whites indiscriminately killed blacks. It was alleged to have continued from 1900 to the 1970s when half-caste children were removed from their Aboriginal mother's communities and raised in religious missions in a calculated attempt to destroy the black race. Ironically, the relationship between colonists and indigenous population was far more harmonious in Australia than Argentina, yet it contemporary Australians are far more keen to portray it as one of war than are contemporary Argentians. Both Argentina and Australia have an element of the population that is anti-American. Some Argentineans accuse America of trying to destabilise their governments. Other Argentineans blame America for supporting the Argentine government when it was accused of human right’s violations. They also accuse America of using the International Monetary Fund and The World Bank to spread U.S. hegemony in Argentina and Latin America. In Australia, the anti-American element might stem from a fear Americans are trying to culturally colonise Australians. Alternatively, America might be criticised because Australians have a tendency to criticise powerful nations. Many of the differences between Argentina and Australia can be explained using a psychological theory known as Linguistic Determinism. The theory asserts that the structure of a language shapes its users thoughts. In regards to how English and Spanish may shape the thoughts of users, it is best compare English speaking and Spanish speaking countries as a group. With the exception of New Zealand, the major English speaking countries have been prolific in the invention of team sports. England invented rugby union, rugby league, test cricket, one day cricket, 20/20 cricket and hockey. Ireland invented hurling and Gaelic football. Australia invented Australian football, touch football, indoor cricket, and polocrosse. Canada invented ice hockey and Canadian football. The US invented netball, basketball, gridiron, lacrosse, baseball and softball. Unlike English speaking countries, Spanish speaking countries have not been prolific in the invention of team sports. Admittedly, Argentina invented pato, but it is rarely played. Although Spanish speaking countries have not invented many team sports, they have invented a lot of dances. Spain invented flamenco. Argentina invented tango. Spanish speaking countries in the West Indies invented salsa, rumba and cha cha. Another difference is that none of the English speaking countries have been able to evoke sufficient emotional symbolism to overthrow their own governments. (America overthrew a British government.) In the case of Australia and Canada, activists can't even get a sufficient number of people to think that becoming a republic is important. While English speaking countries have not been effective at achieving revolutions, Spanish speaking countries have. Following a period of social chaos, dictatorships have then emerged to provide social order. With the exception of New Zealand, all the major English speaking countries have a long history of invention and innovation (see Australian inventions.) Spanish countries have not been no innovative. Taken as a group, it seems the English language cultivates teamwork and innovation. The Spanish language cultivates emotions. Although emotional expression helps people feel more alive, it is not always conducive to economic development or social harmony. As the ancient philosopher Aristotle correctly identified, intelligence resides in three realms- logos (logic), ethos (morals) and pathos (emotions). Each form of intelligence can be in conflict with the other. Argentinean culture and history shows a high governance by emotions. Australian history and culture shows more of a governance by logic and morals. (Admittedly, the logic and morals of Australia have sometimes been less than intelligent.) For Australians, the emotional realm has largely been confined to sport. Although Australia has some emotional people, they struggle to persuade others to share their emotion. Furthermore, their attempts to be emotional often appear contrived. It is almost like they feel they should be emotional and strive for emotional culture. For example, the desire to become a republic in 1999 was essentially an emotional one. It was about a large scale symbolic gesture that could make people feel better about themselves. Even though it was an issue of the heart, arguments in favour of becoming a republic in 1999 were logical and moral. Some Australians had a moral argument that the Queen was not relevant to non-English speaking migrants. Others had a logical argument that becoming a republic would make Australia less racist or sexist. The arguments were neither morally or logically intelligent. Essentially, the failure of the vote revealed the failure of proponents to make an emotional argument that resonated widely. Buy Australian campaigns are another example of Australian arguments favouring morals and logic instead of emotions. The campaigns have some kind of pragmatic arguments that if Australians buy Australian products, more money will stay in Australia.